Hotel Première Classe Hotel Rouen Sud - Zénith - Parc des Expositions, 1 star, was renovated in 2007. It has since a capacity of 71 rooms for 1, 2 or 3 people, all air conditioned and equipped with a cabin shower and toilet. It can accommodate groups as well as families or business travelers. 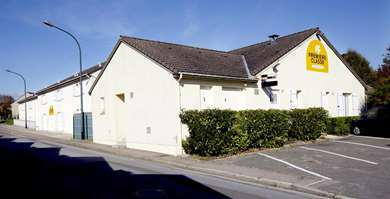 Its location in Saint-Etienne du Rouvray, just outside Rouen (3 and a half miles away), allows easy access to the exhibition center (a quarter mile away), nine economic activity zones, including the universities of Madrillet, but also the local region famous for its numerous forests, parks and gardens. On the leisure side, the Zénith of Rouen and the FCR stadium are also very close. 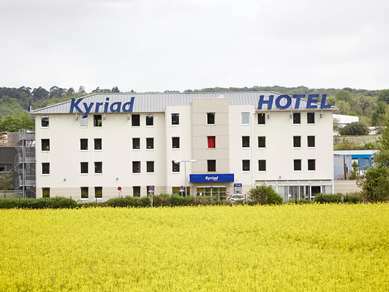 This hotel can be an ideal stopover point along highway A13 (exit 23) as it is 30 miles from Evreux, 63 miles from Dieppe, 50 miles from Le Havre, 55 miles from Etretat and 75 miles from Paris. In the same "Parc Expo" industrial zone, 15 minutes away on foot, the Campanile Restaurant will warmly welcome you for lunch or dinner. 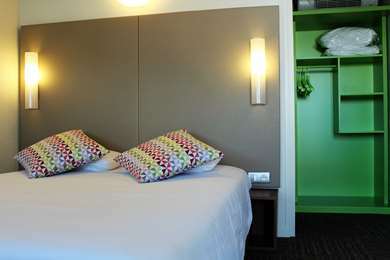 Completely renovated in 2007, Hotel Première Classe Rouen Sud - Zénith - Parc des Expositions has 71 rooms with individually adjustable reversible air conditioning, and a private bathroom (private shower, sink and toilet). 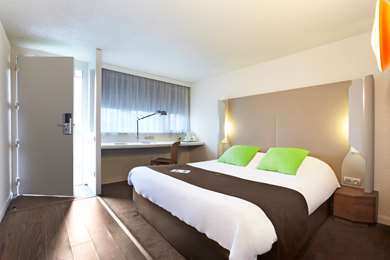 In addition, rooms are equipped with a flat-screen TV with built-in alarm clock, a desk and free Wi-Fi. To meet all your needs, our hotel offers several types of beds, depending on the room: double beds, twin beds or bunk beds. The hotel is also accessible for people with reduced mobility: 3 parking spaces and 3 adapted rooms are provided for this purpose. Fill up on energy with the buffet breakfast, for only €5.90, at Hotel Première Classe Rouen Sud - Zénith - Parc des Expositions. Children ages 10 and under receive a 50% discount (offer valid for paying hotel guests, up to 2 children per adult). No better but no worse. 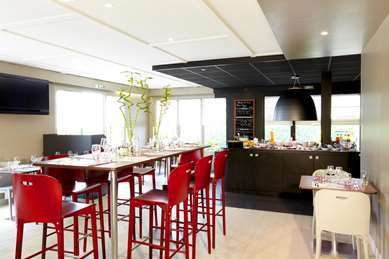 I travel to France two or three times a year and always use PremiereClasse motels. The accommodation is basic but always clean and tidy. As we use it just for overnight stays while travelling through France it serves its purpose, always value for money if you book in advance. As the cell door was slammed shut, I lay down on the shabby smoke infused room for a nights rest. The bed was ok and the sheets were clean. However singing revellers and slamming doors on other floors in the early hours woke us multiple times. So overall a pretty poor experience. thank's to giving feedback of your experience in our hotel. Room staff will be informed of your disatisfaction. We used this hotel for an overnight on our way south. We arrived late and had problems which could have been made easier if information had been provided on the email confirmation. The system is that if you arrive after 9pm you find somewhere to leave your car and walk through the side gate to find the automatic reception. With this hotel it is found on the far side, away from the entrance gate. Then enter your details and you will get your room number and the gate code along with your room "key". This procedure could be provided as standard on the email with perhaps the allocated room numbers. We arrived after midnight (as we had advised) and probably disturbed a few people trying to work out what to do. At the gate it says the code is on the invoice but you don't get an invoice until you have been in - but without your car. Once we sorted all this out the room was as expected but the breakfast times are not published in the room so pay attention if you are not getting up early - it finishes at 10 but you don't have to leave the room until 12. This hotel is regularly fully booked so reservations are required. I knew about the local taxes but even so the costs were more than expected and I have not worked out why yet - be sure to check and take this up with reception in the morning. thank's to take time to giving feedback. We apologize for the embarassment. If you like staying in a cargo container with doors and feel like you’re in a sardine tin then this is the place for you. Absolutely dreadful place to stay and absolutely nothing close by to do. Nearest place is a drive away and is basically a ghetto. Without doubt the worst place we have ever stayed. Avoid it like the plague. We thank you for making a return for your stay. arrived late so car park gate closed & when eventually got the code from Mute reception lady(computer says no), the keypad outside does not work! have to use the keypad inside gate, why not fix keypad & send code to customers on email when booking made?TV not working & noisy in room as door seals not effective.apart from that the rooms are clean & reception for breakfast was very nice & helpfull. I remember your arrival well and I'm sorry. The Breakfast Service Team thanks you for your feedback.